R v Sussex Justices, Ex parte McCarthy ( 1 KB 256,  All ER Rep 233) is a leading English case in which emerged the oft-quoted aphorism "Not only must Justice be done; it must also be seen to be done." When High Court noticed deficiencies in investigation and prosecution, most common sense remedy could have been ‘retrial’ i.e., remanding back to trial court to summon the witness who is not examined and examine the material if not properly examined. 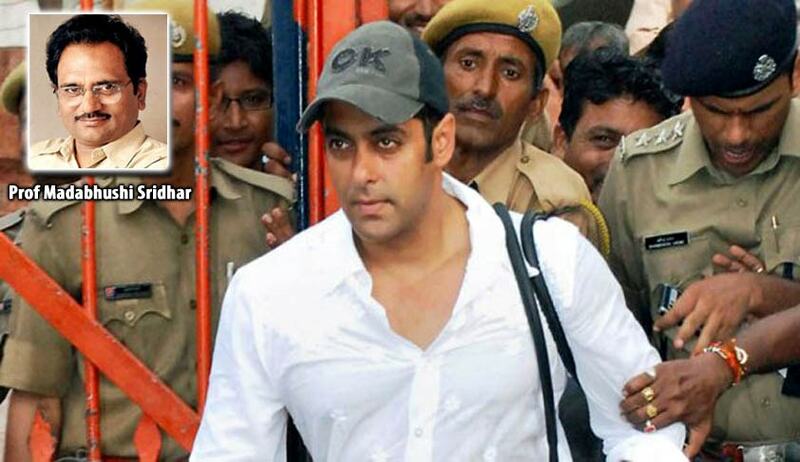 Why should Salman Khan be acquitted of all charges? Not only injustice was done; but also appears to be done. The message that went across this episode, is truthful witnesses will die ignominious death and high profile criminal accused would escape the jail if they can hire top lawyers. Why should police cop Ravindra Patil die? Why not Kamaal khan is not called? Why the lower court believes some evidence and High Court does not give any credence to the same? On September 28, 2002, Ravindra Patil, a police body guard of Salman Khan, was waiting outside the hotel, when star was drinking. Then star drove Toyota Landcruiser on to the steps of A1 bakery at the turning in Bandra, mowed down five persons sleeping on footpath and dashed into a laundry in Bandra. Patil was sitting inside car. Khan denied all charges the next morning, and Patil recounted seeing Salman so stunned that people were crying under his car’s wheels. So shocked, that Khan fled, instead of taking victims to the hospital. Only Patil knew if accused was drunk, speeding, and had been warned by Patil to slow down. As usual, other witnesses changed their narrative and soon turned hostile, but Patil did not, in spite of alleged pressures from Khan’s men to change his statement. On 12 March 2006 Patil was arrested for not attending court sessions and sent to Arthur Road Jail, a non-bailable warrant was issued against him.In 2007 he was found on the streets of Mumbai, suffering from TB for over 2 years. His family, the police which employed him, the media, and super star - everyone had forgotten about him. His version was totally believed by the lower court while High Court doubted it. Their doubt was about status of Khan as ‘drunk’ at the time of accident. High court felt that deposition of Patil was unreliable and that was enough to acquit the star of all charges holding innocent. Death of one and injuries to four others was undeniable. To good fortune of Salman Khan and misfortune of rule of law, Patil died along with the truth. Maharastra Government decided to appeal from, a really welcome step as that keep hopes alive for rule of law. In India the witnesses and complainants die or get jailed in our country in high profile cases, as they can’t sustain weight of truth and strength of manipulations and corruption. Why FIR was not given due weight? FIR is a key document in criminal trial. It is enough if it reflected the core crime. It need not consist of all the details. Proximity of its filing, lack of contradiction in later depositions make FIR strong enough to be relied upon for conviction. If it is improved later, that will not reduce the value. This is the core value of FIR. We teach this in class room. The High Court pointed out that in FIR,Patil did not allege that Khan was drunk. It was added in his later statements. The rule is details could be explained afterwards. It cannot be disbelieved simply because another fact was added, unless it contradicted. Even if Khan is believed not to be drunk, there was everything to show that he was negligent, which is enough to convict him with a lesser punishment at least. To believe it or not totally depends upon the judicial discretion. One cannot find fault with higher judiciary’s disbelief of this FIR and version of Patil, the deceased complainant. But it is unfair to Patil, Prosecution and the feeble truth that boldly stood the ground till the trial court. Former DG of CBI, Mr R K Raghavan lamented: The FIR is a sacrosanct document, especially when there is no abnormal delay in filing it. There was no delay in this case. Second, the FIR need not necessarily be a comprehensive document explaining all circumstances relating to the incident, as long as it gives basic facts that make out a case. PSO Patil had deposed unequivocally, before the investigating officer and the Metropolitan Magistrate who conducted the initial trial, about how Mr. Khan was guilty of rash and negligent driving. Unfortunately, Patil died before he could be examined by the Sessions Court….To dismiss his version of the incident as inconsistent or unreliable seems grossly unfair to the prosecution, especially when there is nothing to suggest that he was motivated. We are told we can write a whole book on how Patil, after his categorical statement to the police against Mr. Khan, was harassed within his own professional group and by outside elements determined to pull Mr. Khan out of the mess. Why Kamaal is not called? Only Patil or Kamaal knew whether Khan was drunk and driving with negligence. High Court rightly said Mumbai Police not made serious efforts to get at Kamaal Khan instead, it reversed acquittal. Patil’s statement should have been believed. If not, the police should have called Kamaal Khan to depose before the court. The High Court reversed verdict instead of waiting till Kamaal Khan is summoned. It should have reverted trial back to lower court to summon Kamaal and conclude. Somebody called Ashok Singh appeared late during the trial to say that he was at wheel and not Khan. Patil is not believed, Kamaal is not called, Ashok Singh’s claim prevailed. Justice did not appear to have been done. If there is none at steering, how car mowed pedestrians? If prosecution and lower courts were wrong on procedural aspects, why accused should get benefit from that? Why not fresh investigation and re-trial was advised? Why there was no probe against harassment of Patil? Why no action was taken against officers who are responsible in continuing licence to drunken drivers? Who are guilty of such dereliction of duty? What are rules and regulations or guidelines for taking samples of blood, delay in sending to forensics and storage lapses of those samples? Why there is only one forensic lab to test these samples? Why Khan’s blood sample reached the lab late? Why trial was prolonged? Why FIR was not given due weight? People have right to know. Read his earlier Columns on LiveLaw here.